America’s capital city, Washington D.C., is a busy but smallish stretch of land sandwiched between the states of Maryland and Virginia. It’s super popular with both foreigners and Americans who want to perhaps catch a glimpse of the President (unlikely) or sample some of the hundreds of museums and monuments in the city. The problem is how to choose – there is a lot going on no matter what time of year. Here are my top ten favourites for things to see while you’re in D.C. 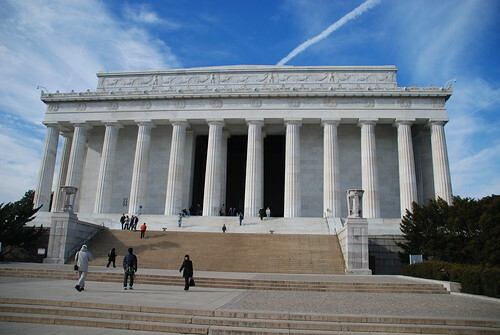 While Washington has plenty of monuments and memorials, the Lincoln Memorial (pictured above) is one of my personal faves. It has a terrific view from the top of the stairs, overlooking the National Mall, but it is so a stunning place to be at dusk, when the night illumination starts. If you’ve got the wee ones with you, or if anyone in the family is a aviation or technology buff, then the Smithsonian National Air and Space Museum really is a must see. It is one of the best tech museums I’ve ever seen in the world, and their collection is incredible, ranging from well known exhibits to esoteric finds you can’t take your eyes away from. Be sure to budget plenty of time for this one – it’s a big place. This is one of the most poignant sets of statues in D.C. – 19 soliders, frozen in time mid-march though a forest setting. It’s chilling to read the names, hear the story, and see these brave men staring right back at you, their reflections clear in the water. 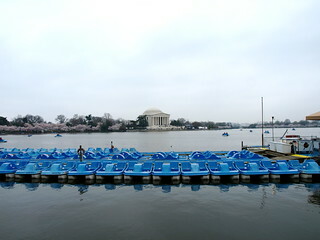 Paddle boats are without a doubt cheesy and touristy. But the view is fantastic, especially on a clear sunny day. Like many cities, the view from the water is different than walking around the water, so I suggest it. And it’s only like $5 a person for an hour – a great way to have a little bit of fun. Dupont Circle is Washington D.C.’s most fashionable neighbourhood. There are beautiful homes lining the leafy tree-lined streets, each punctuated by parks and fountains and artisan coffeehouses. The social hotspots can all be found here, both bars and clubs and some of the city’s best restaurants. Bookstores and other boutiques make for good souvenir shopping. No need to be a geology geek or enjoy all the sparkly gems on display here – some of them are so huge/odd you can hardly believe that Mother Earth actually produced such a thing. Plenty of hands on, touchy-feely exhibits for the wee ones, and interesting scientific facts for the adults. Good fodder for your next pub quiz. D.C. has very restrictive building height regulations, so if you hadn’t noticed, there are few tall buildings. The Old Post Office is one of the highest, and the tower of this gorgeous buildings has what I think is the best view of the city. It’s also slightly less crowded than the other view points, though we went early in the day – your mileage might vary. This is a fantastic daytrip just outside the city. The park is massive, and no cars are allowed inside, which makes for a very peaceful day out. Trail maps are very easy to follow and will take you alongside canals and waterfalls, alongside beautiful stretches of forest. This gorgeous building is probably the closest thing ever to come to legends of the Library of Alexandria. The library, also called the Jefferson Library, is the largest collection of books in the world, and the detailing of the interiors rivals those of Rome or Paris. Guided tours are available for free. That’s just a sample of my favourites in D.C. – go and visit. There’s plenty more to see and do!